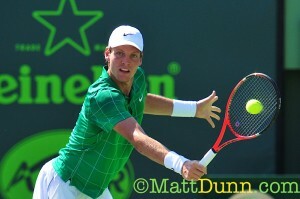 In the second male semifinal at the Sony Ericsson Open, the majority of the highlight reel was filled by Tomas Berdych. Berdych, the 16th seed, squashed Robin Soderling, the 5th seed, 6-2, 6-2 to move on to the finals where his ultimate challenge will be Andy Roddick. When Berdych sent a forehand wide following a great return in the initial game of the match, Soderling had break point. However, with a series of booming serves including an ace on game point, Berdych held. Similarly, Soderling had a comfortable game his first time out. But, on his second trip, Soderling was pushed to deuce. 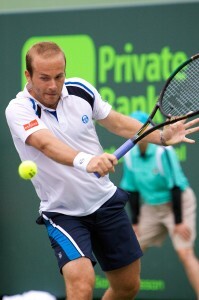 Nevertheless, with a forehand winner, Soderling pocketed the game for 2 all. Yet down at 2-3, Soderling made two errors; then, with a forehand up the line winner, Berdych gave himself triple break point. When Soderling dumped a backhand into the net, Berdych moved ahead 4-2. After easily consolidating, Berdych broke Soderling at love for the second successive occasion to terminate the set. Up to this juncture, Soderling had two primary problems, a low first serve percentage and too many errors, particularly with his main weapon, the forehand. Yet, despite being blown off the court the first set, Soderling’s body language was positive. In the first game of the second set, when Berdych committed an error serving at 30-0, Soderling pumped his fist. That attitude at least helped Soderling out of a tight spot in the second game. As a result of a double fault, Soderling stared at double break point. Although with difficulty, Soderling carried the game for 1 all. Then for the first time in the match, by forcing a couple of mistakes on Berdych’s serve, Soderling had 0-30. Still, with Soderling incapable of finding a decent return rhythm, Berdych inched in front 2-1. The next game, when Soderling’s forehand up the line missed its mark, Berdych had break point. Luckily, Soderling came up with the answers, erasing a total of two break points to equalize things at 2 all. However, serving at 2-3, Soderling’s forehand up the line miscue resulted in a break point for Berdych. Unable to find the range with another forehand, Soderling handed Berdych a 4-2 advantage. 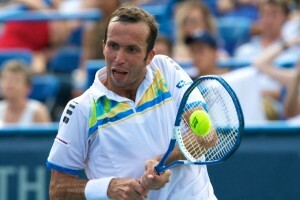 After Berdych consolidated quickly for 5-2, he pressured Soderling into a caravan of errors to arrive at match point. Then, with a return winner, Berdych ended the match and claimed the remaining final spot. Q. 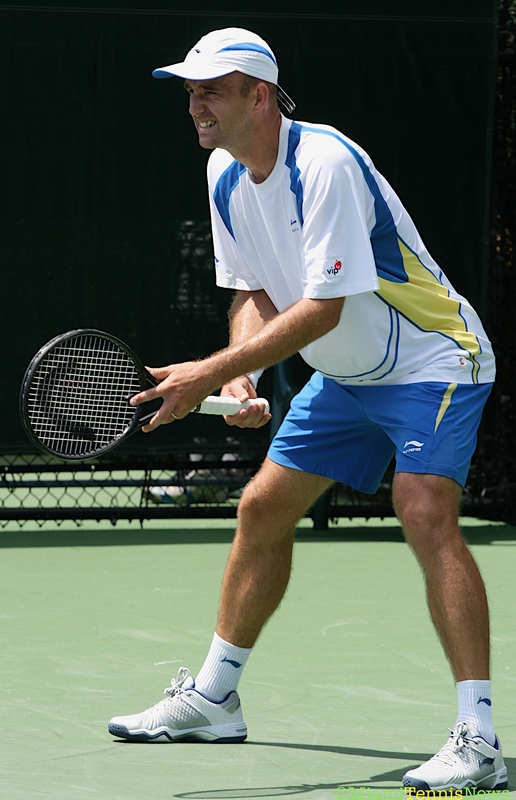 The last two times you met Robin, one was in Sunrise in a challenger series here, and [the other in] Kuala Lumpur. He pretty much beat you handily. How did you change your game plan or tactics today? BERDYCH: Yeah, I mean, it was I would say pretty simple. Both of those matches he was playing really aggressive[ly] and I was just . . . waiting for some mistakes or something and giv[ing] him too much time to just do on the court whatever he want[ed]. So, this time I just need[ed] to play more aggressive. . . Step a little bit more into the court, try to play faster and a little longer shots against him, and just not give him too much time. Then all the errors can come. That’s what happened today. I was serving pretty [well] today. But, I would say really [the] key point was in the first game when I was break point down. . . Maybe if . . . he took [that game] and start[ed] really strong, the match could be different. It wasn’t, so I’m happy for that. Two weeks after Novak Djokovic was ousted in the semifinals in Rotterdam by Mikhail Youzhny, in the final of the Dubai Tennis Championships the defending champion avenged that loss in beating Youzhny 7-5, 5-7,6-3 for his first title of the year. The final was played over two days because of rain. On Saturday, after cruising along on serve, Djokovic hit a bump. Following errors by Djokovic, with a forehand swing volley winner, Youzhny had breakpoint. The Russian converted when Djokovic’s forehand landed wide. However, after Novak erased a game point with a forehand winner for deuce, Mikhail dumped the next two strokes into the net leveling the set at 3 all. Subsequent to a routine hold, Djokovic earned double break point with a forehand crosscourt winner. When Youzhny netted a backhand, Djokovic took a 5-3 lead. However, serving for the set, Djokovic started with two miscues for 0-30. After producing a beautiful forehand up the line winner in a seemingly never-ending point which Youzhny had multiple opportunities to take; a fatigued Djokovic double faulted to stare at double break point. Courtesy of another error by Novak, Mikhail obtained the break to get back on serve. Serving to push the set to a tiebreaker, Youzhny sent a backhand long to go down break point. Then, the Russian misfired on a forehand volley to give Djokovic the set. 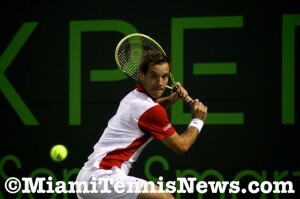 After Djokovic carried a rain interrupted first game, he capitalized on a error filled game by Mikhail to jump ahead 2-0. With Djokovic trying to consolidate, at 30-15, the match was postponed due to heavy downpour. Today when the players returned, Djokovic promptly took a 3-0 edge. Although arduous, Youzhny maintained serve for 3-1. Sleeping on it did Youzhny well. After Djokovic began his game with a double fault, Youzhny produced a forehand up the line winner for double break point. The Russian got back on serve by crushing a backhand down the line. Despite struggling, Youzhny squared the set at 3 a piece. Serving at 3-4, Youzhny fought off break point to hold. The next game, Djokovic double faulted to donate a break point. With an overhead winner, Youzhny took a 5-4 advantage causing an angry Djokovic to destroy a racket. However serving for the set and ahead 30-15, after a backhand crosscourt pass winner by Djokovic, Youzhny committed two straight errors which permitted Djokovic to break back. Unfazed however, Youzhny baited Djokovic into errors and broke at love. Then, with a love service game, Youzhny send the match into a third set.